Thanks for asking Andrew. 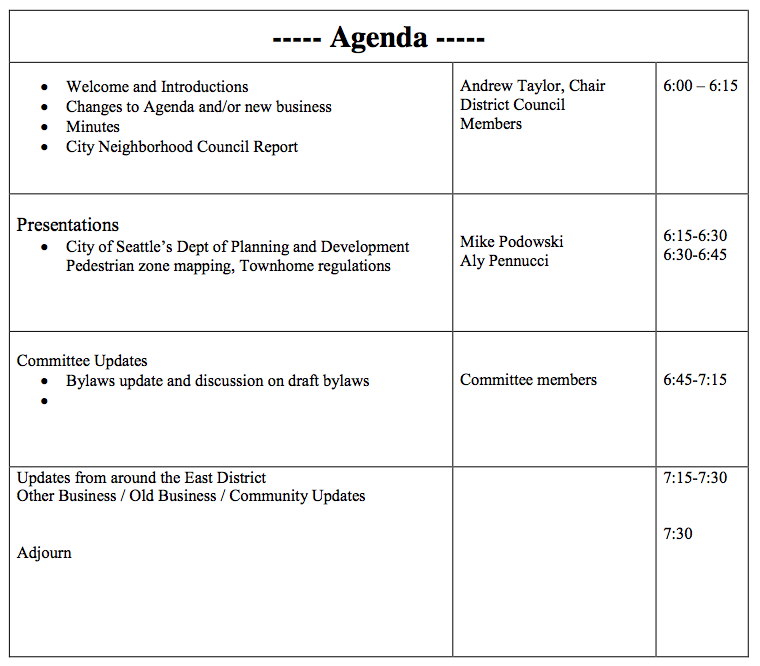 Mike Podowski said he would be able to do this meeting … he is much, much more familiar with the rowhouse regulations than I! Thanks. 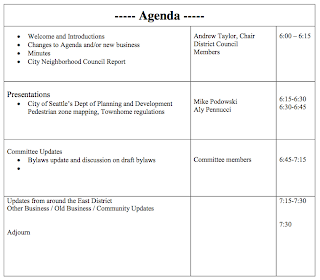 So Mike will be at our meeting to describe what DPD means by a "row house" and what the implications might be for us. Mike Podowski forwarded me your contact info and suggested I get in touch to see if you have time on the East District Council meeting agenda to discuss the pedestrian zone mapping project I am working on. This project is considering rezoning a variety of areas around the city to promote more walkable neighborhood business districts by adding a Pedestrian Zone designation to an underlying Neighborhood Commercial Zone. A pedestrian overlay designation is intended to protect an existing pedestrian-oriented retail district, or encourage the development of such a district. In addition, we are considering adding a few additional standards in pedestrian zones, including: overhead weather projection, wider sidewalks, minimum densities and additional street-level uses. In the East District the changes we are considering would apply to the areas with an existing pedestrian zone designation and any areas being considered for a pedestrian zone designations (see attached map). *Note that the timeline will be updated on the project site soon to reflect more time for the entire process.